I was invited for tasting the Parsi food at My Place, Movenpick Hotel and Spa last Saturday by Chef Rayomund Pardiwalla. He has selected a few of his grandmother’s secret recipes for this event. I had never tasted Parsi food before and was excited to attend this event. When I reached the venue, I was welcomed with a big smile by the staff and provided with a seat. A bread basket was served at our table with butter. Since we were thirsty, we ordered fresh lime soda to freshen up a bit. 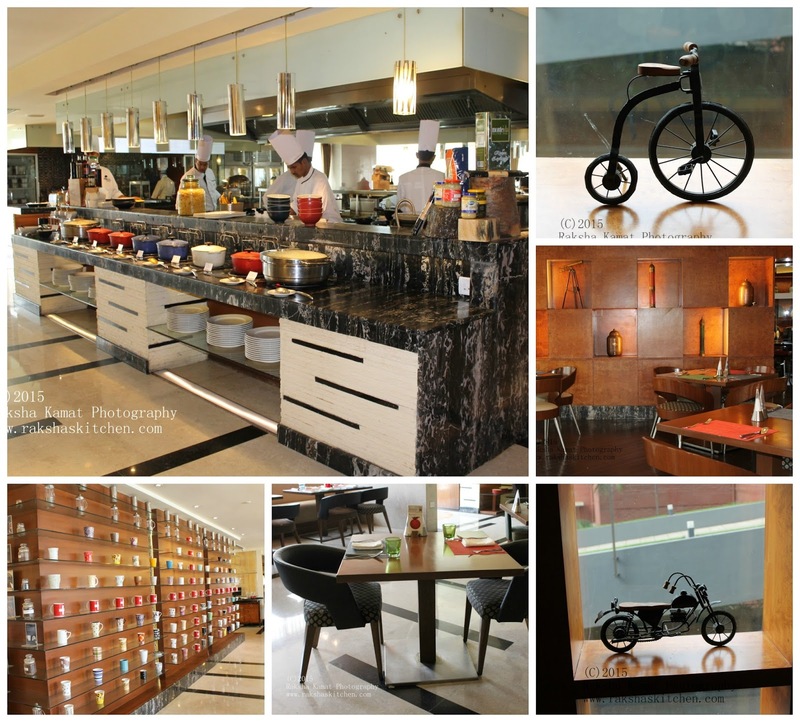 My Place at Movenpick had a luxurious type of ambiance. There were several grills and live cooking stations around. The salads and dessert counters also looked inviting. There was a bar too where mocktails and cocktails were being made. The seating arrangement was widely spread and there was lot of place to move around freely. I really liked this because the kid could run around freely. The service was good and the staff at the hotel were quick to get the food that we ordered. Since my kid was hardly eating any food, I requested a steward to get some Chicken fried rice and he quickly got it at my table. They were also re-filling the dishes as soon as they got over. 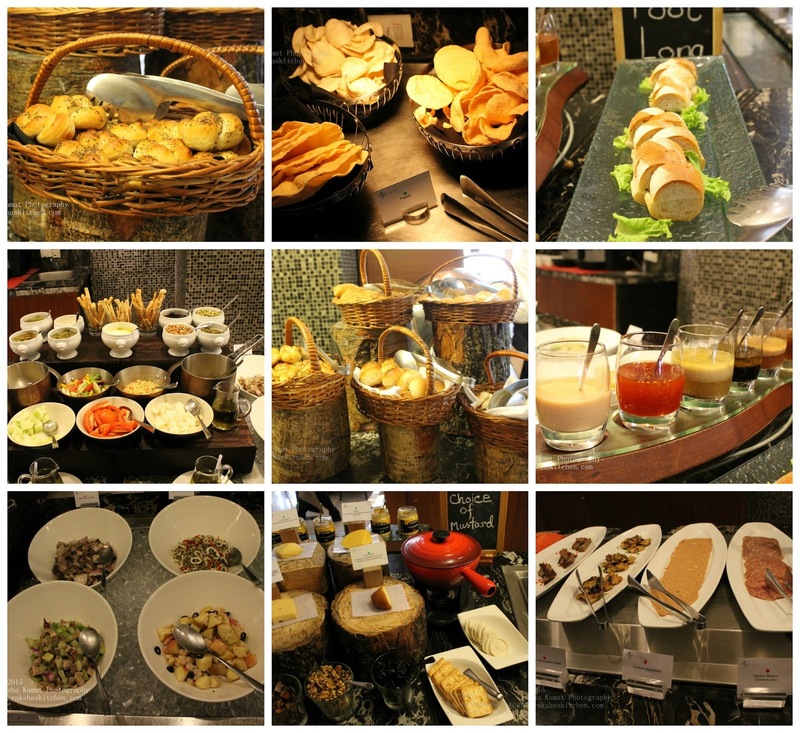 Since I went to the hotel to taste Parsi food, I hopped on to check the buffet which was vastly spread around. I did not try the salads as I only wanted to savour the Parsi food. We were served with some starters. The veg and non-veg starters were good. In veg starters we had Aloo Kali Mirch and Ajwaini Paneer Tikka. The Paneer tikka was flavored with carom seeds. In non-veg starters we were served with Mahi Seekh Kabab i.e. fish skewers cooked in clay pot oven and grilled chicken. The fish kabab was slightly bland and i had to eat it with pudina chutney, but the grilled chicken was awesome. I then thought of trying the Parsi food. I found only few Parsi dishes being served on the buffet. The rest of the dishes were from different cuisines. Ginger Ale was served at our table and it was worth a try. The various Parsi dishes in main course for the non-veg were Dahi no gos means lamb curry with yogurt. Since I don’t eat lamb I did not try this dish. Gaam no Patio means Parsi fish preparation. The fish used was black pomfret. I am not sure if it is supposed to be like that but the sight of fish head with eyes in the curry kept me away from this dish. Jerdalu Ma Marghi was a chicken curry made with apricots and shallots. This dish was made up of chicken wings and since it was being served with skin, I did not feel like eating this. I did taste the curry and liked the curry. I had this curry with rotis. Chana ni daar which is Parsi chick pea preparation. I liked this dish and it had a homely taste too. Papeta ne sekhta hi seenah was a Parsi dish with potato and drum stick and was average in taste. Patta gobhi ki bhaji or cabbage subzi was good and tasted like that made at home. Pumkin masala was also present on the buffet but I did not taste it. Parsi pulao named browne rice was my all time favorite. I had to go for a second serving of this dish. 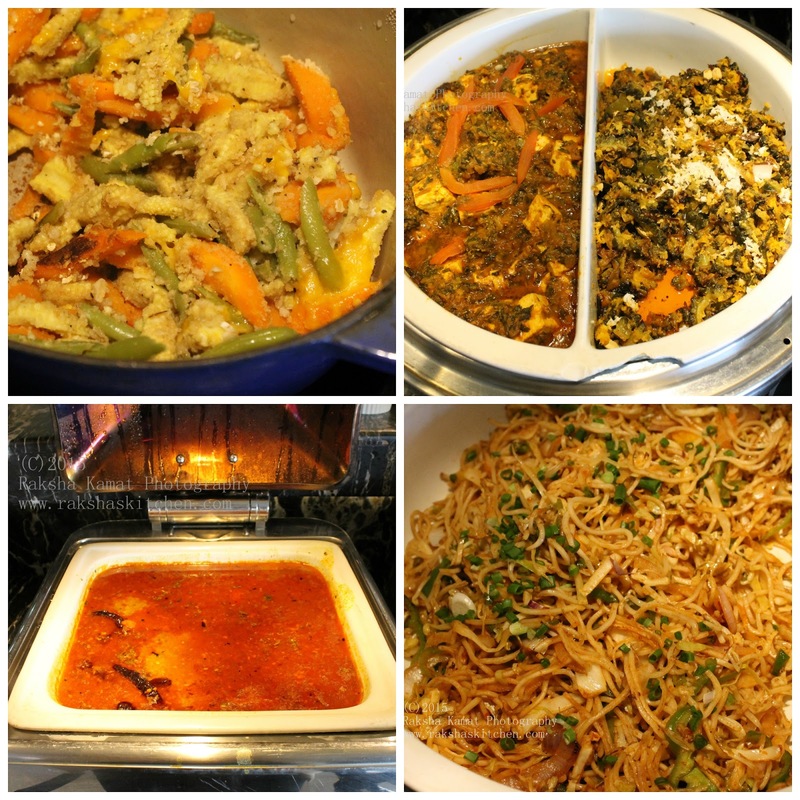 The other dishes which on the menu were from non-Parsi cuisine. 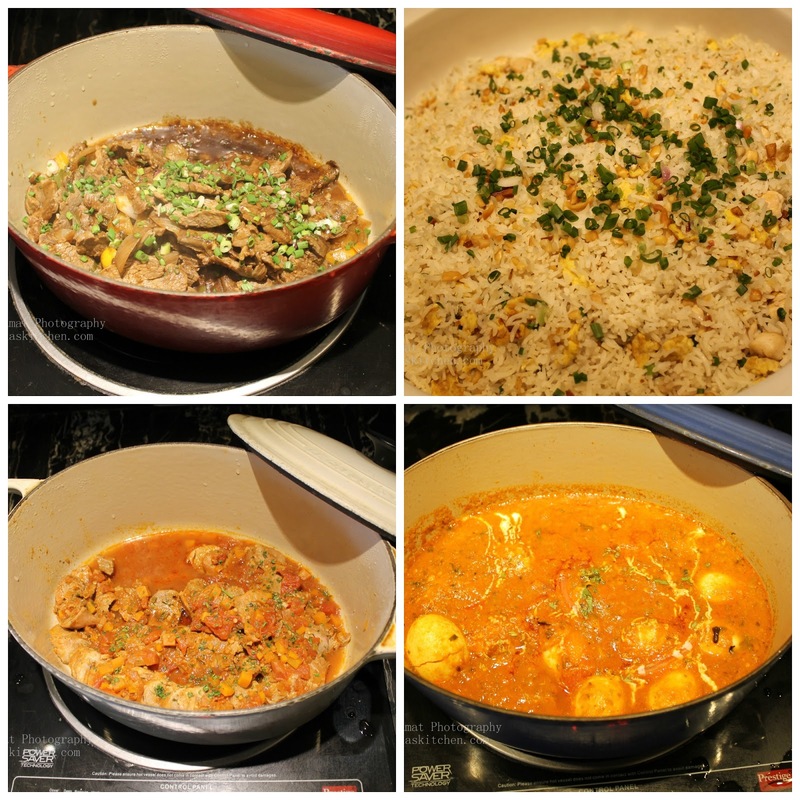 These were Murg dum biryani, Egg Masala, Spanish Braised Chicken, Pot roasted soya beef and chicken fried rice. In the veg too there were non-Parsi dishes like dal tadka, methi paneer, pavakkai peratal i.e bitter gourd tossed in south Indian spices, crumbed vegetables, chilli garlic noodles, stir fried vegetables, parsley potato and papad. Pavakkai Peratal & chilli garlic noodles was really good. The desserts were widely spread and there were a variety of them like strawberry pastry, linzer tart, mango mousse, chocolate gateau, chocolate brownie, apple spiced cake, Parsi pudding, suji halwa and lot more. I really enjoyed the desserts. Though I had high expectations about Parsi food, I did not much enjoy it. I am not sure if Parsi dishes are cooked this way i.e. fish with head and eyes intact and chicken wings with skin on. But I loved the Parsi pulao and chicken curry. I wish there were more Parsi dishes which I could try like Parsi omlette, Koimino patio or prawns curry and chicken farcha. I have read a lot about these dishes and sometime in future I would like to taste these.